Toddler-wearing. It looks as dreamy as it was. For the first time in weeks, I had a cry/whine free night (until well past his bedtime), and I attribute it all to a little snuggle sesh with mama after work. See, for some reason I had gotten it into my thick head that Potamus was getting too old and heavy to be carried around all of the time. His whining to be picked up and when I was cooking dinner was grating on my nerves, I want to say “go play with your toys buddy, I’m cooking,” but I realized, in a conversation with a friend, that perhaps Potamus needs some more quality time. And perhaps that quality time is spent being carried or physically close to me, because, after all, he’s away from me all day when I’m working. Now, it’s not that I’ve been neglecting him, it’s just that I see how independently he can play and know that I want some free time to myself. But mostly I want there to not be whining. So if holding him is going to stop that whining then I’m going to do it. I’m going to do it even if people think I’m spoiling him. Because, he can learn to wait his turn at daycare. And he can learn that I can’t always rescue him (sometimes a lady’s gotta pee without a kid on her lap, people! ), but this revelation that I’ve been missing physical contact and snuggles with Boof, that maybe, just maybe, Potamus has been missing simply being close to me and getting to see the world go by. 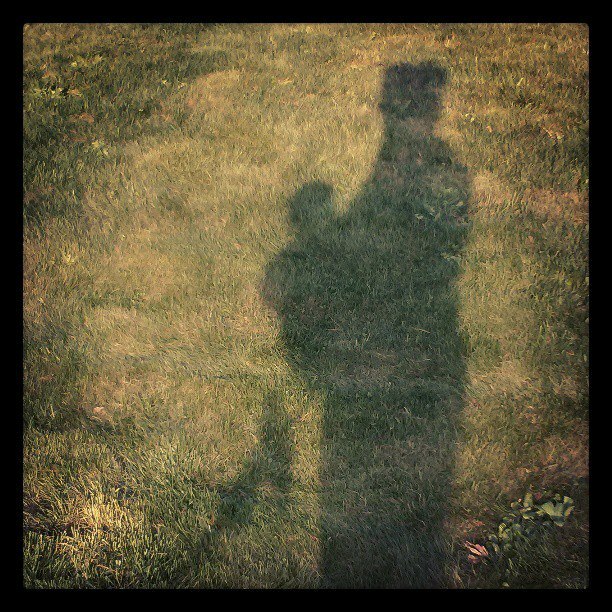 The Ergo pack, with a baby on my back, seems awkward, so I whipped out the ol’ ring sling again and have been using it to go on evening jaunts with little guy after dinner and bath, but before Boof gets home for bedtime. Yesterday I decided to not wait until our walk. I put him in it from the minute we got home, and with the exception of eating and bathing, we were attached at the hip all night. There’s something blood-pressure-raising about a toddler scrambling at my ankles and tugging on my pant leg wanting to be held. There was nothing stressful about having him strapped to my hip while making dinner, except trying to be extra mindful of where the pans and knives were so that he didn’t just reach over and pull boiling spaghetti sauce on me. While I didn’t get to sit on the couch reading my awesome crime novel, I was pleased that I was able to make dinner without fuss, and felt like we were really connected all evening. I can’t hold him all the time. And I don’t think that’s what he wants or needs. 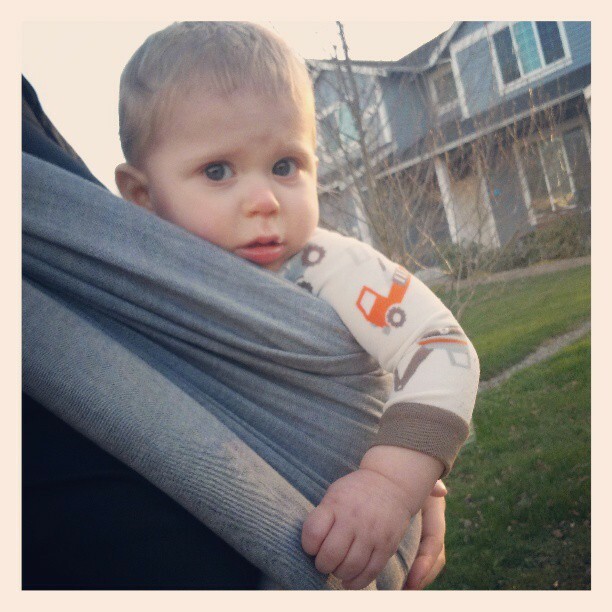 But it was nice to anticipate the need for some quality snuggles by using the ring sling, and I think they’ll probably be many more walks around the neighborhood with him hitched to my hip. I am listening to the sweet little snores coming from Potamus as he is wrapped all snuggly up inside our ring sling. He’s been crabby lately, not sure if it’s a cold that he got from grandma, growth spurt, or the fact that my diet has consisted of Oreos and spaghetti for the past few days. At any rate, I have no idea how parents who don’t babywear do it. Potamus handles the swing/bumbo/vibrating chair for maybe 15 minutes at a time (tops) unless he’s already asleep (after much bouncing/rocking/walking/swaying) and then we can maybe get 45 in the swing if we’re lucky and he doesn’t wake up mid-transfer. With him all wrapped up in a carrier, we are able to get some things done around the house. I have folded laundry, done dishes, swept, made the bed and Boof’s specialty is playing video games while babywearing and bouncing on our large exercise ball. 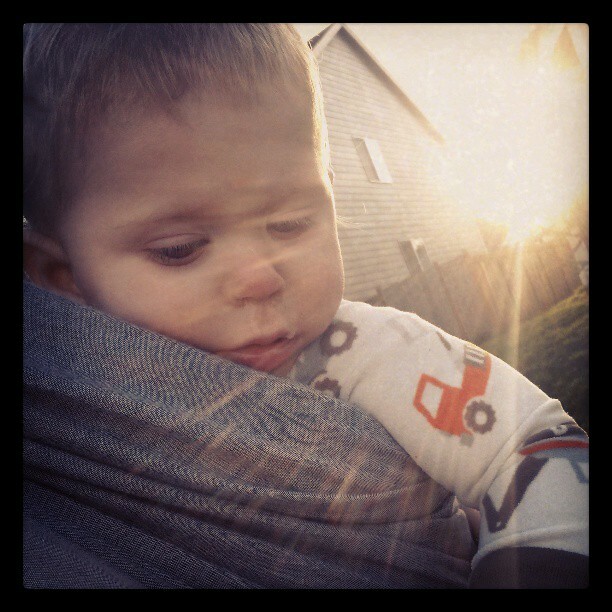 Even when I was pregnant, I knew that I wanted to be a babywearing mama. 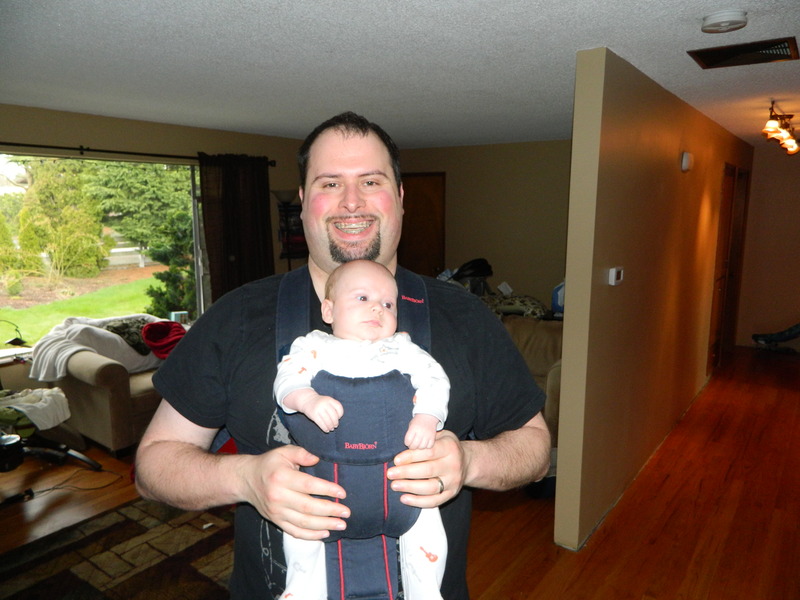 What I didn’t know was that Boof would be on board just as much as me.Granted, he has embraced the Baby Bjorn that feels more masculine to him (and laughs at my suggestion that he try the Moby). I mostly use the Moby, but have also begun to use the ring sling and have an Ellaroo Mei Tai type that I want to use when he can spread his legs a little more. I bought that one for my mother-in-law who wants to carry Potamus around, but doesn’t want the complicated tying that comes with the Moby wrap. Today, as Potamus was wailing, and I put him in the ring sling and he began to calm down, Boof joked and said “we sure are baby carrier afficionados,” and I had to agree…my desire to wear my baby on my person had taken a whole new turn fromwhat I expected. 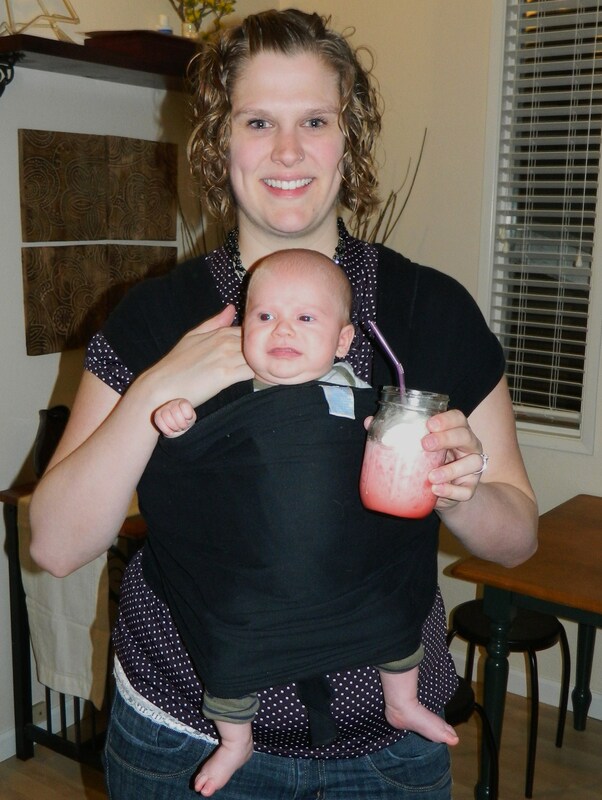 We have a 2nd hand bjorn, an Ergo, a Mai Tai, a ring sling, and a Moby. I am sort of addicted and need to quit trolling Craigslist for more baby wraps and carriers!